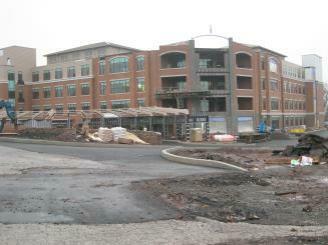 Above: South Eastern Veterans Center located in Spring Mills, PA. PMD poured over 150,00 sq.ft. of floors on this 5 story building. Below: Phoenixville Middle School. This project had over 175,000 sq.ft. of flat work and PMD poured over 5000 cy of concrete in this entire project. Above: Lincoln University Student Center located in Oxford, PA. PMD poured over 1,600 cy of concrete in the foundations alone on this project. Right: poured and finished slab on grade with a decorative saw cut on curved radius to matched with stained floor finish pattern. Above: Euro Motor Cars of Devon, PA. A special feature of this projected is the heated concrete driveways to prevent snow build-up.